* Creates a smooth and polished effect with added natural shine. * Aids against static build-up. * Whilst drying the hair the heat is distributed quickly for fast and effective styling. * The brushes also have ergonomically designed handles for easy grip & maximum control. * Ceramic barrels aid against static build-up. * Vent holes allow warm air to circulate at the roots of the hair, to allow fast and effective blow-drying and styling. * Each brush has a removable sectioning tool in the handle. 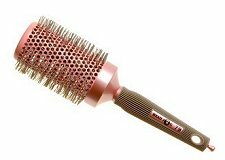 At 50mm (79), A radial brush coated with ceramic to help smooth the hair as you style.